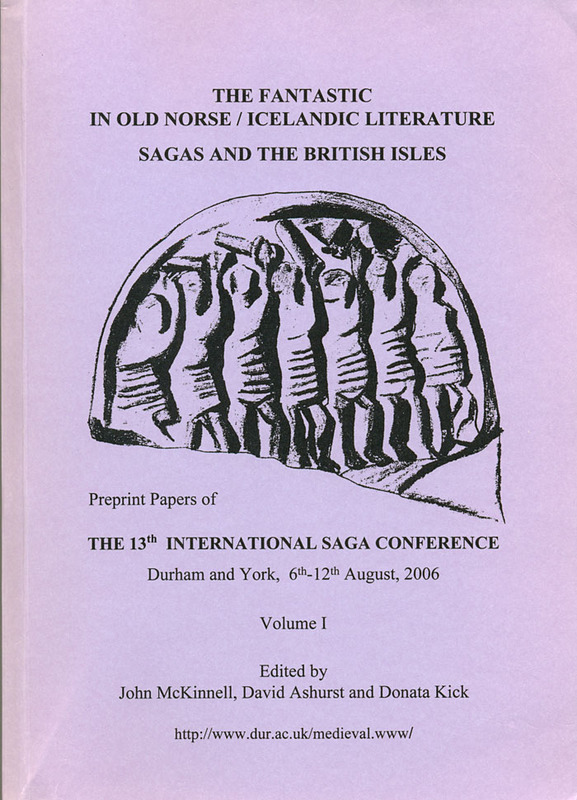 The Fantastic in Old Norse/Icelandic Literature: Preprint Papers of the 13th International Saga Conference, Durham and York 6th-12th August 2006, I-II, ed. John McKinnell, David Ashurst and Donata Kick (Durham: Centre for Medieval and Renaissance Studies, 2006). Sirpa Aalto: Categorizing otherness in Heimskringla. Christopher Abram: Snorri’s invention of Hermóðr’s helreið. Lesley Abrams: Viking Northumbria — the non-saga evidence (abstract). Aðalheiður Guðmundsdóttir: On supernatural motifs in the fornaldarsǫgur. Carolyn B. Anderson: Fantasy in Njal’s saga: History as spectral past (abstract). T.M. Andersson: The earliest Íslendinga saga: Another candidate. Emily Archer: It is generally thought that you are rather too poor : Saga Iceland, a marriage proposal, rejection and the reasons why (abstract). Ármann Jakobsson: The good, the bad and the ugly: Bárðar saga and its giants. Ásdís Egilsdóttir: The fantastic reality: Hagiography, miracles and fantasy (Plenary paper). Auður Ingvarsdóttir: Hafði eg ór hvorri er framar greindi : Þróun í ritun Landnámabókar. Massimiliano Bampi: Between tradition and innovation: The story of Starkaðr in Gautreks saga. Bjørn Bandlien: Cultural contacts between England and Norway after the Conquest. Geraldine Barnes: Margin vs. centre: Geopolitics in Nitida saga (A cosmographical comedy?). Simonetta Battista: Blámaðr, djǫflar and other representations of evil in Old Norse translation literature. Karen Bek-Pedersen: Are the spinning nornir just a yarn? A closer look at Helgakviða Hundingsbana I 2-4. Chiara Benati: The fantastic and the supernatural in the Saga Ósvalds konúngs hins helga: Patterns and functions. Yvonne S. Bonnetain: Riding the tree. Ingvil Brügger Budal: A translation of the fantastic. Trine Buhl: Illusions of mimesis (abstract). Jesse Byock: Recent excavations in Mosfellsdalur (abstract). H.C. Carron: History and Þórðar saga kakala. Marlene Ciklamini: Folklore and hagiography in Arngrímr’s Guðmundar saga Arasonar. Margaret Clunies Ross: Poetry and fornaldarsǫgur. Jamie Cochrane: Land-spirits and Iceland’s fantastic pre-conversion landscape. Amy C. Eichhorn-Mulligan,: Contextualizing Old Norse-Icelandic bodies. Elín Bára Magnúsdóttir: An ideological struggle: An interpretation of Eyrbyggja saga. Alexey Eremenko: The dual world of the fornaldarsǫgur. Thor Ewing: í litklæðum : Coloured clothes in medieval Scandinavian literature and archaeology. Oren Falk: Fragments of fourteenth-century Icelandic folklore. Fulvio Ferrari: Gods, warlocks and monsters in Ǫrvar-Odds saga. Alison Finlay: History and fantasy in Jómsvíkinga saga. Frog: Recognizing mythic images in fantastic literature: Reading Baldrs draumar 12-14.
sonr Óðins — but did Snorri know that? Gísli Sigurðsson: The mental map of the British Isles in the Icelandic sagas. Gísli Pálsson and Astrid E.J. Ogilvie: Weather and witchcraft in the Sagas of Icelanders. Galina Glazyrina: Dragon motifs in Yngvars saga víðfǫrla. Siân Grønlie: Miracles, magic and missionaries: The supernatural in the conversion þættir. Guðrún Nordal: To dream or not to dream? A question of method. Guðvarður Már Gunnlaugsson: The origin of Icelandic script: Some remarks. Fernando Guerrero: Supernatural drinking horns (abstract). Terry Gunnell: How elvish were the álfar? Natalya Gvozdetskaya: The myth of Valkyries and the female characters of the heroic lays of the Elder Edda (abstract). Jan Ragnar Hagland: As you like it? Narrative units recycled: Norðimbraland in sequences of saga writing. Odd Einar Haugen: On the diplomatic turn in editorial philology. Eldar Heide: Spirits through respiratory passages. Helgi Skúli Kjartansson: English models for King Harald fairhair? Helgi Þorláksson: The fantastic fourteenth century. Pernille Hermann: The Icelandic sagas and the real: Realism in Þorláks saga. Kate Heslop: Assembling the Olaf-archive? Verses in Óláfs saga Tryggvasonar en mesta. Ann-Dörte Heynoldt: Draumar mínir villa oss : On the use of the first person plural in contexts of individuals in skaldic stanzas. Bengt Holmström: Ego Cnuto — a Winchester document with Scandinavian implications. Lise Hvarregaard: Sagatræ i Einar Már Guðmundssons Universets engle. Ingunn Ásdísardóttir: Frigg and Freyja: One great goddess or two? Tatjana N. Jackson: The fantastic in the Kings’ sagas. Judith Jesch: Norse myths and legends in medieval Orkney. Karl G. Johansson: Hervarar saga’s stanzas and the manuscript that met the reader (abstract). Vera Johanterwage: The use of magic spells and objects in the Icelandic riddarasögur: Rémundar saga keisarasonar and Viktors saga ok Blávus. Jon Gunnar Jørgensen: Thormod Torfæus og det fantaskiske i sagalitteraturen. Marianne Kalinke: The genesis of fiction in the north (Plenary paper). Merrill Kaplan: Out-Thoring Thor in Óláfs saga Tryggvasonar en mesta. Kári Gíslason: The fantastic in the Family sagas: Implications for saga authorship. John Kennedy: The Íslendingasǫgur and Ireland. Donata Kick: Old Norse translations of Ælfric’s De falsis diis and De auguriis in Hauksbók (abstract). Kjartan G. Ottósson: Árni Magnússons samling av skaldedikt i AM 761 a — b 4to. Jana Krüger: fara í vestrvíking : Wikingfahrten mit dem Ziel britische Inseln in den altnordischen Konungasǫgur. Annette Kruhøffer: Thorkell the tall — A key figure in the story of King Cnut. Hans Kuhn: Þórðr hreða in saga and rímur. Henning Kure: Drinking from Odin's pledge: On an encounter with the fantastic in Vǫluspá 28-29. Annette Lassen: Hrafnagaldur Óðins / Forspjallsljóð — Et antikvarisk digt? Philip Lavender: The translation of prophetic imagery in Merlínusspá (abstract). Christina Lee: Cast a cold eye on life, on death : Disease in the sagas (abstract). Emily Lethbridge: Curses! Swords, spears and the supernatural in the versions of Gísla saga Súrssonar. Shannon Lewis-Simpson: The role of material culture in the literary presentation of Greenland. Fredrik Charpentier Ljungqvist: Kungaideologin i Sverris saga. Maria Cristina Lombardi: The travel of a homily in space and time: The Old Norse translation of Ælfric’s De falsis diis. Emily Lyle: A temporal triad in three sagas. Rikke Malmros: Kristne fyrsteskjaldes syn på samfundet. Teodoro Manrique Antón: Vinr em ek vinar míns : Guðrún Gjúkadóttir in Gísla saga and Íslendinga saga. Tommaso Marani: The Roman itinerary of Nikulás of Munkaþverá: Between reality and imagination. Edith Marold: Tannhäuser im Norden? Marteinn H. Sigurðsson: The fantastic feats of Master Perus of Arabia (abstract). Inna Matyushina: Magic mirrors, monsters, maiden-kings: The fantastic in riddarasögur. Bernadine McCreesh: Elements of the pagan supernatural in the Bishops’ sagas. Rory McTurk: Kings and kingship in Viking Northumbria. John Megaard: Hva skrev Snorri? Stephen Mitchell: Perceptions of the supernatural and other elements of the fantastic in the fornaldarsögur . Jakub Morawiec: Vinða myrðir, Vinðum háttr: Viking raids on the territory of Slavs in the light of skaldic poetry. Else Mundal: The treatment of the supernatural and the fantastic in different saga genres. Agneta Ney: The edge of water in Old Norse myth and reality. Ólafía Einarsdóttir: The venerable Bede: Father of the western world’s chronology, and grandfather of Icelandic historical writing. Carl Phelpstead: Historicizing plausibility: The anticipation of disbelief in Oddr Snorrason’s Óláfs saga Tryggvasonar. Cyril de Pins: The fantastical theology of Snorri Sturluson: A reading of the Prologue of Snorra Edda. Russell Poole: Counsel in action in Hrafnkels saga. Edel Porter: Skaldic poetry: Making the world fantastic. Rosemary Power: Gaelic love tales in Iceland: A case of multiple introduction? Judy Quinn: The end of a fantasy: Sǫrla þáttr and the rewriting of the revivification myth. Reynir Þór Eggertsson: The Griselda story: The transformation from the patient Griselda to Gríshildur the good in Icelandic tradition. Jonjo Roberts: Religious visions and Christian rule in Old Icelandic romance. Gunnhild Røthe: The fictitious figure of Þorgerðr Hǫlgabrúðr in the saga tradition. Philip Roughton: Þa syndi hann þeim mikinn skugga : Unmasking the fantastic in the Postola sögur. Elizabeth Ashman Rowe: Helpful Danes and pagan Irishmen: Saga fantasies of the Viking Age in the British Isles. Giovanna Salvucci: Between heaven and hell: The konungasǫ;gur and the emergence of the idea of Purgatory. Christopher Sanders: Sturlaugs saga starfsama: Humour and textual archaeology. Jens Peter Schjødt: The notion of berserkir and the relation between Óðinn and animal warriors. Jens Eike Schnall: Rationalizing the fantastic (abstract). Katja Schulz: Trollweiber, Hundsköpfige und heidnische Priesterinnen — Vom fantastischen Spiel mei Literarischen Genres in der Sturlaugs saga starfsama. Tatiana Shenyavskaya: Mythological accounts of land-taking in the Icelandic conception of history (abstract). Rudolf Simek: The fantastic in Eddic poetry and the renaissance of the twelfth century (Plenary paper, abstract). Leszek P. Slupecki: Facts and fancy in Jómsvíkinga saga. Blazej Stanislawski: Jómsvíkinga saga and archaeology: The presence of Scandinavians in Wollin as source for the legends (abstract). Rolf Stavnem: Fremstillingen af det fantastiske i Eyrbyggja saga (abstract). Gro Steinsland: The fantastic future and the Norse sibyl of Vǫluspá. Nichole Sterling: The North Sea triangle: Iceland, England and the negotiation of Norway in the sagas. Svanhildur Óskarsdóttir: Bede and his disciples: The development of universal history in Iceland (abstract). Ilya V. Sverdlov: Kenning morphology: Towards a formal definition of the skaldic kenning, or kennings and adjectives. Sverrir Jakobsson: On the road to Paradise: Austrvegr in the Icelandic imagination. Bernt Øyvind Thorvaldsen: The double scene in performance: Deictic blending in Völuspá? Clive Tolley: The Historia Norwegiae as a shamanic source. Torfi Tulinius: Is Snorri goði an Icelandic Hamlet? On dead fathers and problematic chieftainship in Eyrbyggja saga. Úlfar Bragason: Ekki er mark at draumum : Fantasía í Íslendinga sögu. Jens Ulff-Møller: The Celtic impact on the church in Iceland and Greenland. Fjodor Uspenskij: The category of affinity (Mágsemð) in the Old Norse model of family relations. Vésteinn Ólason: The fantastic element in the Íslendingasögur (Plenary paper, abstract). Vilmos Voigt: Skaldic poetry everywhere? Is there any influence from skaldic poetry on literatures in other European languages? Herbert Wäckerlin: The silence of Sigurðr þǫgli — Vox articulata, vox humana and vox animalia in Sigurðar saga þǫgla. Andrew Wawn: Whatever happened to Úlfs saga Uggasonar? Jonas Wellendorf: Visions and the fantastic. Lars van Wezel: Myths to play with: Bósa saga ok Herrauðs. Diana Whaley: Skaldic flexibility: Discourse features in eleventh-century encomia. Tarrin Wills: The anonymous verse in the Third grammatical treatise. Kendra Willson: Króka-Refs saga as science fiction: Technology, magic and the materialist hero. Kirsten Wolf: The color blue in Old Norse-Icelandic literature. Bryan Weston Wyly: Heita·sk hellor flióta hvatt sem korn á vatne : A paradigm for paradox in Kormákr Ǫgmundarson’s lausavísur. Yelena Sesselja Helgadóttir: Draumvísur and draugavísur in Icelandic sagas: The border between fantasy and reality. Anna Zanchi: The colour green in Medieval Icelandic literature: Natural, supernatural, symbolic? Kristel Zilmer: Icelandic sagas and the narrative tradition of travelogue. Anton Zimmerling: Hví fara heiðnir menn hér? Christian and pagan allusions in the skaldic poetry of the thirteenth century. Þorleifur Hauksson: Sverris saga and early saga-style.